In the last year I've visited New Orleans - once for pleasure and once for work. Both times I just fell more and more in love with the city. From the people, to the music, the culture and history....and of course we can't forget the food! Seems like every restaurant had some in-house version of a corn seafood chowder. So when I got home, and those flavors were calling to me, I knew I had to make my own version. It is a one pot wonder, where you can throw everything in a pot and then let it simmer on the back burner. 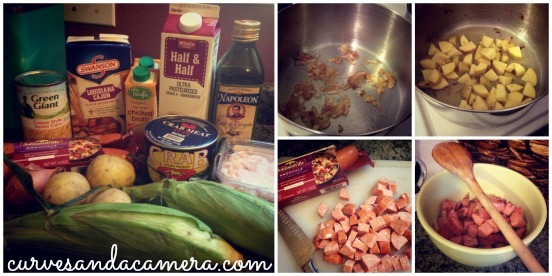 Caramelize shallots, brown some andouille, boil potatoes and then just make sure to put your shrimp and crab in last. I'm still perfecting this dish, but every time I've made it my family gobbles it up and devours bowl after bowl. So obviously I'm doing something right.